You're swimming in Kahana Bay on the Windward side, and suddenly you hit a cold cloud of sea water. Your swim has probably led you to a submarine groundwater discharge site. Ground water can pop through sediment patches on the sea floor or through freshwater springs. Native Hawaiians once were known to fill gourds from these sources for drinking water. But such ground water can also be polluted -- perhaps nutrient saturation from fertilizers or sewage. With related concerns about the balance of nutrients in reef ecosystems, University of Hawaii researchers are trying to document predictable patterns. They have finished their first year of research at Kahana Bay and are about to start the second. Then they plan to move the research site to the south part of Kaneohe Bay, to investigate seepage sites and identify locations affected by pollution past and present. Craig Glenn, geology and geophysics professor, Gary McMurtry, an associate professor of oceanography, and doctoral student Geoffrey Garrison plan to measure the rate and quantity of submarine groundwater discharge. Researchers first gather groundwater samples from land wells in the Kahana Bay vicinity and Punaluu, the next valley north of Kahana. They'll also collect samples from the ocean floor, using domes that cover a little more than one square yard, to measure speed and quantity of seepage into Kahana Bay. By using sophisticated equipment to trace the path of radon and other elements, they hope to estimate the amount of submarine groundwater discharge entering Kahana Bay. "In order to measure the speed and quantity of seepage into the bay we put down Plexiglas domes, and attached to them are two bags," Garrison said. The ground water eventually seeps into the bags, providing flow rates and samples for analysis. Domes stay at a collection site for four to six hours. With radon preserved in gas-tight containers, this material is analyzed for content and quantity. "We isolate the radon and count it," Garrison said. "We are concerned with the inorganic side of the equation -- what the natural system is providing in the way of nutrients to the bay." The trio of researchers hopes eventually to pinpoint nutrient sources, hoping this knowledge will aid reef restoration. 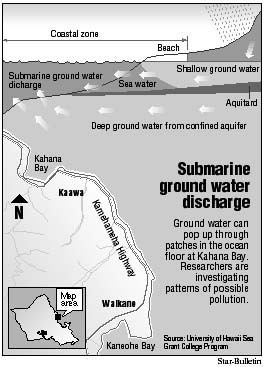 Garrison, who is writing a doctoral dissertation in geology and geophysics on submarine ground water discharge in Hawaiian coastal ecosystems, said the thrust of the research is patterns and quantities of such discharges and the nutrient loads provided by these discharges into coastal waters. "We're going to move the study down to Kaneohe next year, and one of the concerns in Kaneohe is nutrients resulting from anthropogenic impact," he said. That means nutrients coming from people, Garrison said. "Kaneohe is an impacted bay. It's been impacted by human activities for decades, and that human activity has impacted things like the coral reef and fish within the bay," he said. "One of the things that coastal managers are trying to do is clean up the bay so it's a more natural system. If submarine groundwater discharge is a source of unnatural nutrients to the bay, that's the concern that we have." John Goody, former chairman of the Kaneohe Bay Task Force, said: "The more we know about the bay, the more able we are to make proper management decisions. "Most complaints about pollution are from surface runoff but finding out what below-surface seepage is bringing to the bay is important, too, he said. "It would help managers differentiate between the two sources because they have to treat (them) in different ways," Goody said.